Before London Bombing, Leaked UK Memo Warned Iraq War a Key Cause for Growth of “Extremism” in Britain | Democracy Now! British police now believe that four-British-born men carried out last week’s deadly bombings in London that killed at least 52 people and injured 700. Police said all four men are of Pakistani descent and at least three are believed to have died in the explosions. The four suspected bombers were aged between 19 and 30 and were so-called “cleanskins” — with no convictions or known connections to terrorist organizations. Police first learned of the four men when the family of one of them called the police last week to report their 22-year-old son, Hasib Hussain, was missing. Closed circuit television film from around 8.30am the day of the bombings shows four young men, all wearing identical large rucksacks similar to those carried by infantry soldiers. The three subway bombs went off 20 minutes later. Police said personal documents belonging to three of the men were later found at three blast sites. Police have not recovered any timing devices at the bomb sites and it is possible that all four men blew themselves up deliberately. Police raided six homes in and near the northern industrial town of Leeds on Tuesday and arrested a relative of one of the suspects. The relative was brought to London for questioning. The raids led police to a bomb factory in Leeds. Explosives were also found in a car at Luton railway station. Meanwhile, British home secretary, Charles Clarke, today warned that Britain must be prepared for more attacks. He said, “We have to assume there are others who are ready to do the kinds of things that these people did last Thursday.” Britain remains on its highest-ever security alert. Prime Minister Tony Blair’s office said on Tuesday there was no link between last week’s bombings in London and the Iraq war. Not everyone may agree. In the aftermath of the bombings last week, CNN’s Christiane Amanpour was reporting live from the streets of London when her broadcast was interrupted. Christiane Amanpour, reporting for CNN from London. We go now to Britain to speak with Milan Rai, author of “Regime Unchanged” and “War Plan Iraq” and one of the founders of Voices in the Wilderness, UK. He is currently coordinating the group Justice Not Vengeance and has been doing extensive analysis of the aftermath of the London bombings. He joins us on the phone from Hastings, England. Milan Rai, of Justice Not Vengeance. AMY GOODMAN: Well, not everyone agrees. In the aftermath of the bombings last week, CNN’s Christiane Amanpour was reporting live from the streets of London when her broadcast was interrupted. LONDONER: Tell the truth about why this war happened! Don’t touch my bike! Tell the truth about what happened here! We’re in Iraq. That’s why. That’s why it happened. LONDONER: There were fifty killed in Iraq. CHRISTIANE AMANPOUR: As you can tell, and this is actually important, you are seeing a live version of what is aggravating a lot of people here in England and around the world. AMY GOODMAN: That was Christiane Amanpour on CNN reporting from the streets of London last week, being interrupted live on the air, a man saying, “It’s about Iraq.” We go now to Britain to speak with Milan Rai, author of Regime Unchanged and War Plan Iraq, one of the founders of the Voices In The Wilderness, U.K. He is currently coordinating the group, Justice, Not Vengeance and has been doing extensive analysis of the aftermath of the London bombings. He joins us on the phone from Hastings, England. Welcome to Democracy Now! AMY GOODMAN: Can you talk about the latest news, what the police are saying now in Britain about the four young British men of Pakistani descent? MILAN RAI: Well, there are a lot of reports about them, the four young men. There are extensive profiles in the British press of the young men and their backgrounds and the disbelief in their neighborhoods and their communities that these young men, who apparently gave no sign of having strong political views, have carried out these terrible atrocities. The most striking thing about the coverage is that there’s one very big element which is missing. On Sunday, the Sunday Times had a front page story about a secret Home Office / Foreign Office joint report entitled, “Young Muslims and Extremism,” which was a report into why young Muslims in Britain were becoming more and more inclined to support and perhaps to participate in terrorist actions both in Britain and abroad. And one of the conclusions of that report, which was given to the Prime Minister last year, was, and I’m reading from the Sunday Times, “The Iraq war is identified by the dossier as a key cause of young Britons’ turning to terrorism. The analysis says,” — now it’s quoting from the report itself — “'It seems that a particularly strong cause of disillusionment among Muslims, including young Muslims, is a perceived double standard in the foreign policy of western governments, in particular Britain and U.S.'” And It goes on quoting from the report, “'The perception is that passive oppression, as demonstrated in British foreign policy, e.g., non-action on Kashmir and Chechnya, has given way to active oppression, the war on terror and in Iraq and Afghanistan, are all seen by a section of British Muslims as having been acts against Islam. '” So, that’s all quotations from the Sunday Times and from a secret government report which has been leaked to the Sunday Times. It goes right to the heart of the issue, which is gripping the country today, which is dominating news coverage. It’s an authoritative report by the government’s two main departments concerned with terrorism, Home Office and Foreign Office. And it is not there in the media, it’s not there in the newspapers. It’s been barely referred to since the Sunday Times splashed it on the front page. The Sunday Times led on the fact there were British recruits to the al Qaeda network, and those two paragraphs I have just read were not picked up anywhere else in the newspaper. No other newspaper has picked up anywhere else in the newspaper. No other newspaper has picked up on those conclusions. There have been a couple of references to the report and the fact that, you know, the Home Office and Foreign Office found that there were some British recruits, home grown recruits to the al Qaeda networks, but the crucial conclusion that this is to do with British foreign policy is just absent from the reporting that’s going on right now. AMY GOODMAN: Milan Rai, author of Regime Unchanged. In the piece in the Times of London on Sunday, at the very end of the piece, it says the former Scotland Yard chief who retired earlier this year said on one weekend, more than a thousand undercover officers have been deployed monitoring a group of suspected terrorists. Can you talk about what is happening right now in the Muslim community and among Muslim students in Britain? MILAN RAI: Well, there’s a great sense of fear. There are security operations going on. Young Muslim men are not on the streets because of the level of fear that there is right now. It’s very, very frightening what’s happening in terms of the mood turning against the Muslim community as a whole. A poll in the Telegraph found a few days ago that one in five people in Britain believes that Islam itself, not Islamic fundamentalism or al Qaeda or anything like that, but Islam itself, one in five people in Britain thinks that Islam itself is a major threat to British democracy, and that’s a very frightening base for repressive action and for a lot of people turning the other way when repressive action is taken. The same poll found that basically half of the people in Britain thought that Islam itself was some kind of a threat to Western democracy. And so people in Muslim communities around Britain are very, very worried. There’s a real sense that a lot of people in Britain are waiting for the security forces and the police to come down heavy on the Muslim community, and that is bound to create more grievances, bound to create more alienation, bound to create more young men like the ones who have carried out this atrocity. 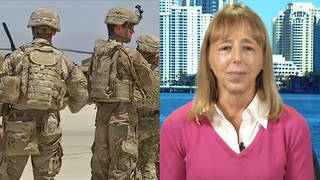 AMY GOODMAN: Milan Rai, over the weekend, a report was leaked in Britain and also we reported it here, about a timetable that had been set up of British and U.S. troops, allied troops, pulling out of Iraq. Did you see that, and it’s interesting it came out just after the bombing? MILAN RAI: It is interesting. I mean, the thing about withdrawing from Iraq is the question is where — what is happening to those troops and what the conditions are for it? If — the strategy has always been in relation to Iraq that to do what in the 1960s and 1970s in Indochina was called the “Vietnamization of the conflict” and to minimize the political costs of the war by reducing the exposure of Western troops, and trying to get Iraqi security forces who will bear the brunt of the retaliation from the population from the fact that Iraq is still under foreign control, whatever the modus operandi is for maintaining control. So, you know, withdrawals from Iraq have always been on the cards, and it’s also been on the cards to retain some troops there. So, if you have Western troops in highly protected zones, and the Iraqis out there actually taking the brunt of it, then you can maintain foreign control with minimal military and, therefore, they hope, political costs attached to that. And that kind of a strategy has worked to a certain extent in certain places, and it’s up to people who are concerned for the Iraqi people to create the greatest possible political costs regardless of the level of risk to British and U.S. soldiers. It’s up to people who are caring about the risk to the Iraqi people to try and increase the political cost of the occupation. AMY GOODMAN: We played that clip of Christiane Amanpour reporting live from the streets of London after the bombing and the man coming up and interrupting and saying, “It’s about Iraq. It’s about Iraq.” How much of that is discussed on your blog, “London blasts pressuring the media.” You talk about the media coverage of this. MILAN RAI: Well, it’s a very mixed picture. One of the curious things that came up in the last few days was a former conservative M.P. who now writes for the Times as a journalist, Matthew Parris, saying that in his very conservative circles, a lot of people are saying, you know, “Obviously, it’s to do with Iraq.” So, I think there is this general perception that people recognize that the war in Iraq has contributed to anger, which has had a partial expression, which has contributed to these terrible atrocities in London. I think there’s a general recognition of that. And there were, you know, conservatives who were warning about these consequences before the war in Iraq. A quote which has not appeared in the newspapers, I think because it’s so sensitive, but former Chancellor of the Exchequer for the Conservatives, Kenneth Clarke, said — before the invasion of Iraq, he said, “When a bomb goes off in a Western city in the future, how much will this policy, invading Iraq, have contributed to it?” And he gave that warning way back in March, 2003, and there were a lot of people who were feeling that way, and there are a lot of people now on all sides of the political divide who feel that what was done to Iraq, what is being done now to Iraq has contributed to this. Obviously, the Justice, Not Vengeance position is that we totally condemn terrorist actions. What we want to see is Britain reducing its participation in and support for injustice in the world, like the invasion and occupation of Iraq, like Britain’s refusal to put pressure on Israel over Israeli policies towards the Palestinians. Britain’s sucking up to Russia about its policies in Chechnya where Britain has offered a lot of diplomatic support to President Putin. AMY GOODMAN: We’re talking to Milan Rai, author of Regime Unchanged, as well as War Plan Iraq, also one of the founders of Voices In the Wilderness, U.K. The BBC Is just reporting about Prime Minister Tony Blair calling for new laws to tackle extremism, he says, in a worldwide drive to tackle the, quote, “evil ideology behind the London bombings.” Blair said there would be profound shock and anxiety at the news the suspected suicide bombers were British. Talks are beginning on bringing in new laws covering preparations for attacks, making it easier to deport people trying to, quote, “incite hatred,” he told M.P.s. He said the moderate and true voice of Islam has to be mobilized. Blair said there was a need and a willingness to act, and consultations are beginning in the next couple of weeks over possible new anti-terror legislation due to be published in the autumn. The laws would focus on measures the police and security services believe there were needed to combat the incitement and the instigation of terrorism, as well as the acts of terrorism themselves. He — the laws involving — well, in this country, the U.S. Congress is taking on issues like these right now. In fact, the Congress is weighing whether to stop the sunsetting of laws in the USA PATRIOT Act, parts of that act, that would involve, for example, the saving of text messages, internet companies saving emails for years. Can you talk about the issue of these laws and how they’re being received by the British public? MILAN RAI: Well, there is enormous support, overwhelming support in Britain, a poll discovered yesterday, for new police powers. There is a widespread acceptance of the idea that the police should have the powers necessary to catch people who carry out these acts and prevent them from happening. So, that’s a fact. That’s how people feel. Now, does that actually add up? Will these powers actually help to prevent these kinds of actions from taking place? Well, what we’re seeing so far with the anti-terrorist legislation in this country is as the human rights group, Liberty, reported last year, what we have seen is that they have been used against the Muslim community in this country in a way that is so heavy-handed and so biased that it’s effectively criminalized much of the community. And that creates alienation. That creates disaffection. That creates people who feel no allegiance to the rest of society. That creates people who are willing to kill their fellow citizens. That contributes to that kind of a mood. So I’m very, very worried by the moves that are taking place now. Curiously, there have been reports, off the record, from ministers saying that we shouldn’t rush into legislation. Some ministers quoted as saying, I think we have gone too far already in anti-terrorist legislation. I think Tony Blair is very much in the driving seat of this. He is using these police and intelligence services as a smokescreen, saying, “We will do what they recommend.” What he does is he tells them what he wants, and then hears a recommendation and then he goes ahead. I think he is brushing aside the concerns of his fellow ministers who are worried about the impact of this legislation and the way it will be implemented on Muslim communities and what that’s going to do in the future. And I’m afraid that what we’re seeing is the very worst aspects of Tony Blair’s personality and approach to politics coming out. And it’s kind of indicating quite a dark future, really, unless it can be resisted. AMY GOODMAN: Milan Rai, author of Regime Unchanged and War Plan Iraq. one of the founders of Voices In The Wilderness, U.K., and Justice, Not Vengeance. Can you give your website? MILAN RAI: Our website is www.JusticeNotVengeance.org, which also shortens to J-N-V.org. AMY GOODMAN: Well, I want to thank you very much for being with us, Milan Rai. MILAN RAI: Thank you very much.